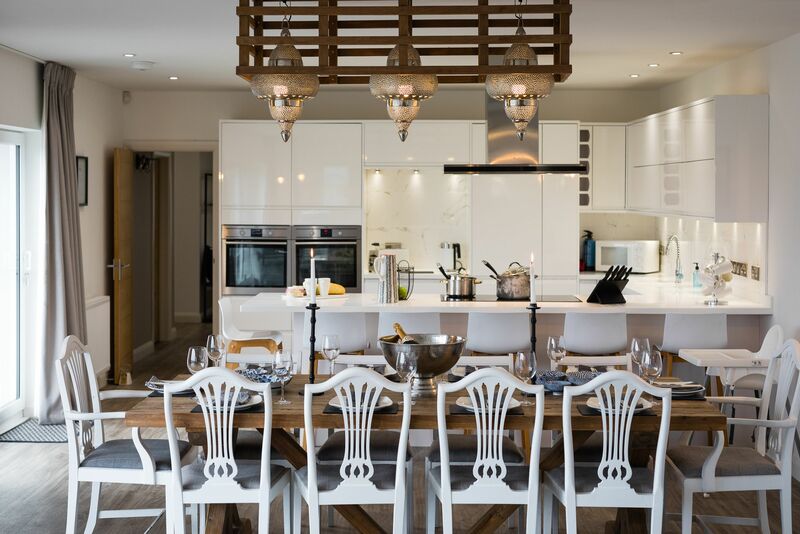 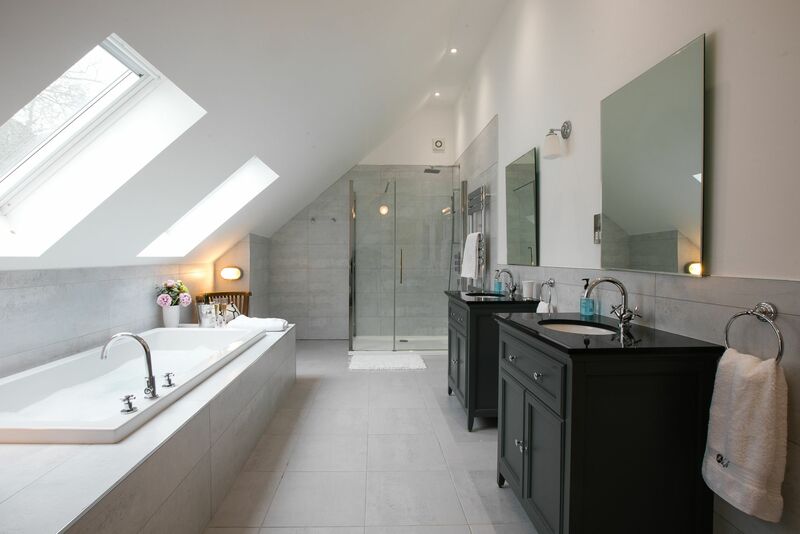 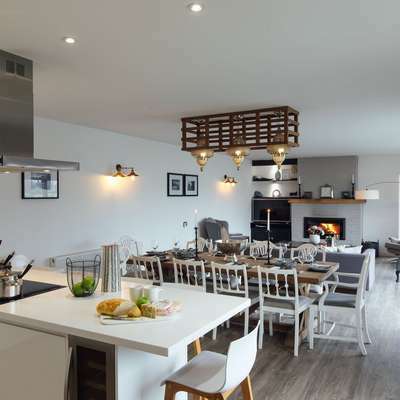 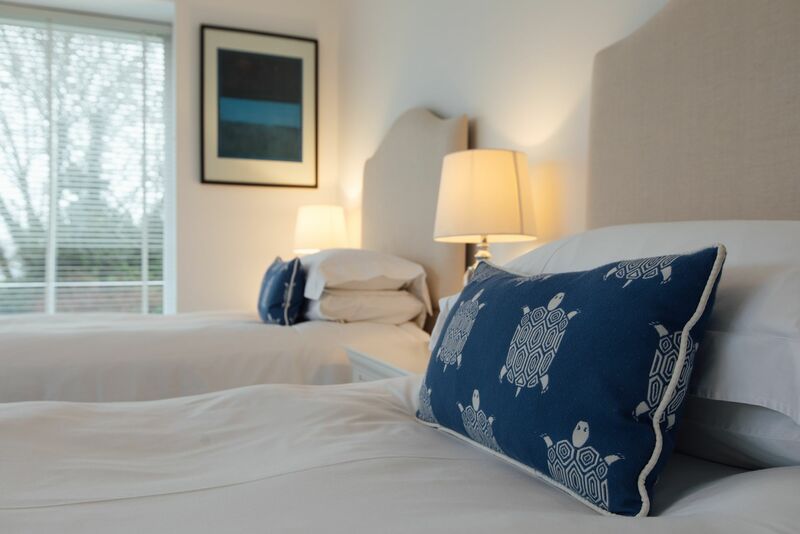 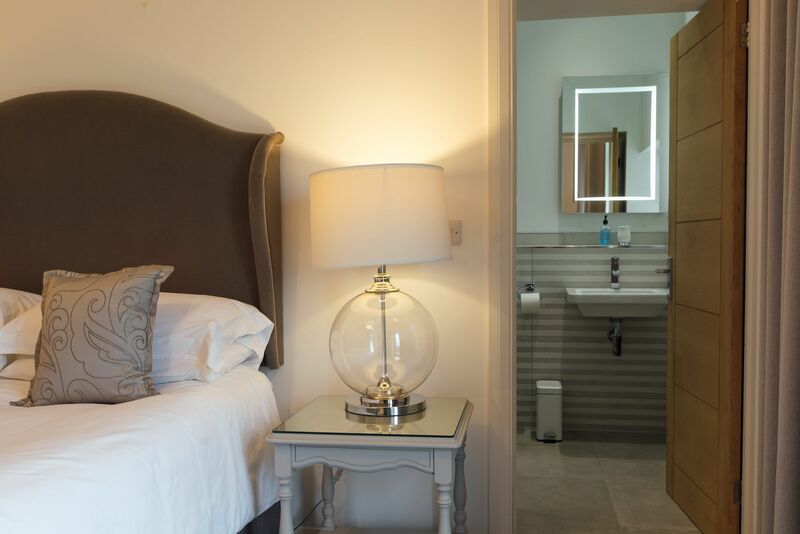 The Hawthorns is a newly renovated, 5 bedroom, 4 bathroom luxury property located in the heart of the village on St Brides Lane where you can enjoy a peaceful and relaxing holiday whilst still being just a stones throw from the centre of the village. 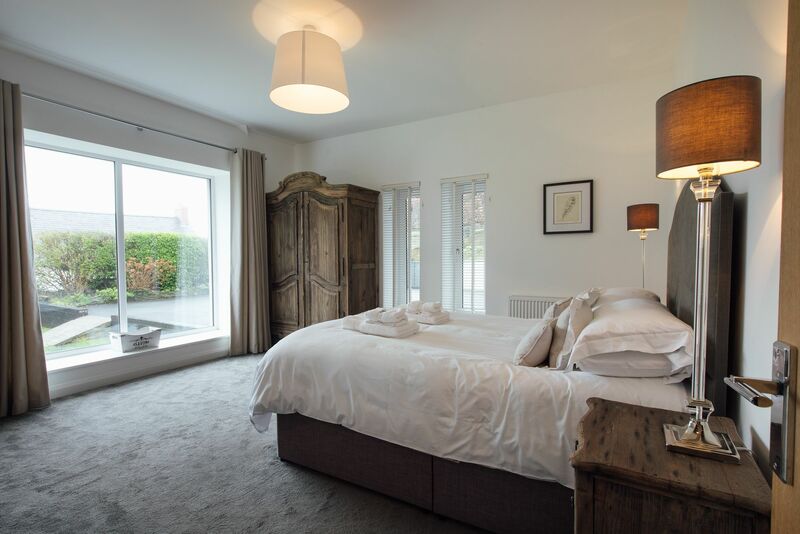 The Hawthorns itself is a truly unique property, furnished and finished to an exceptional standard with the emphasis being on comfort, space, style and 5 star (Visit Wales Graded) luxury, all of which you will find in abundance. 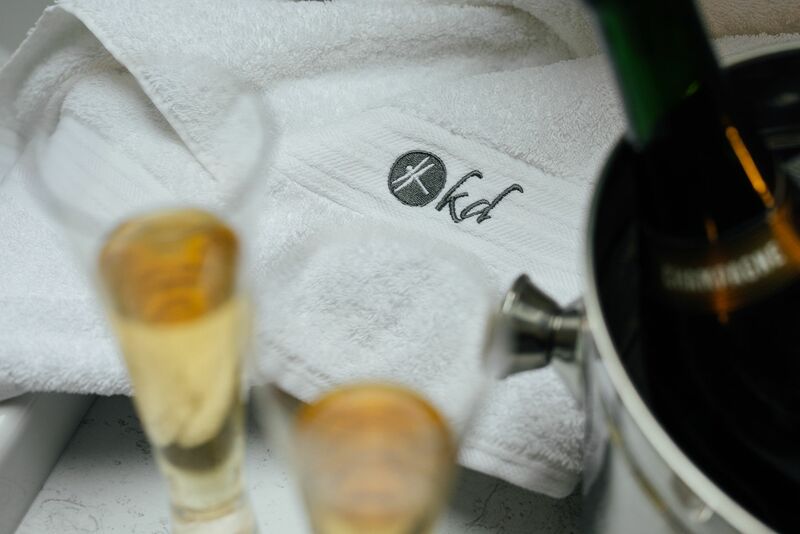 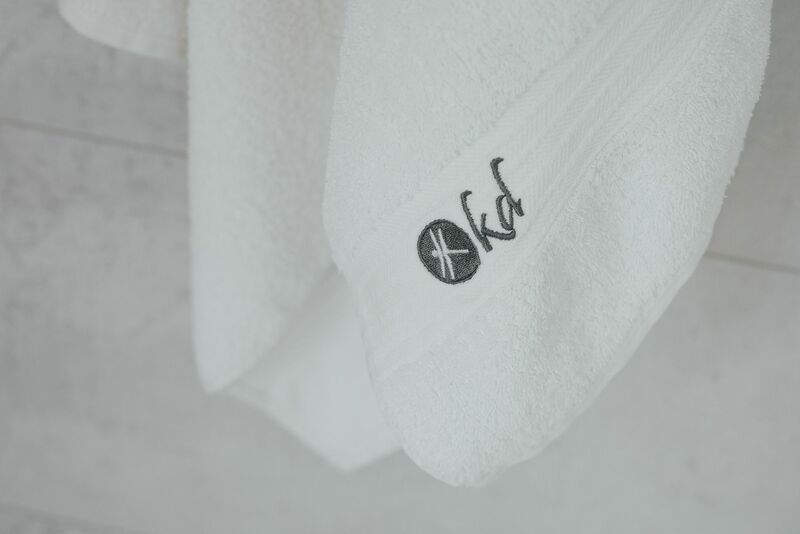 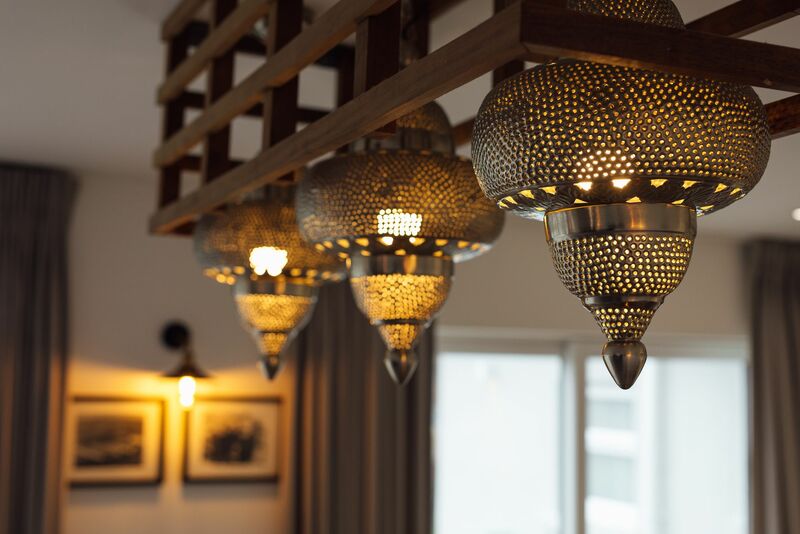 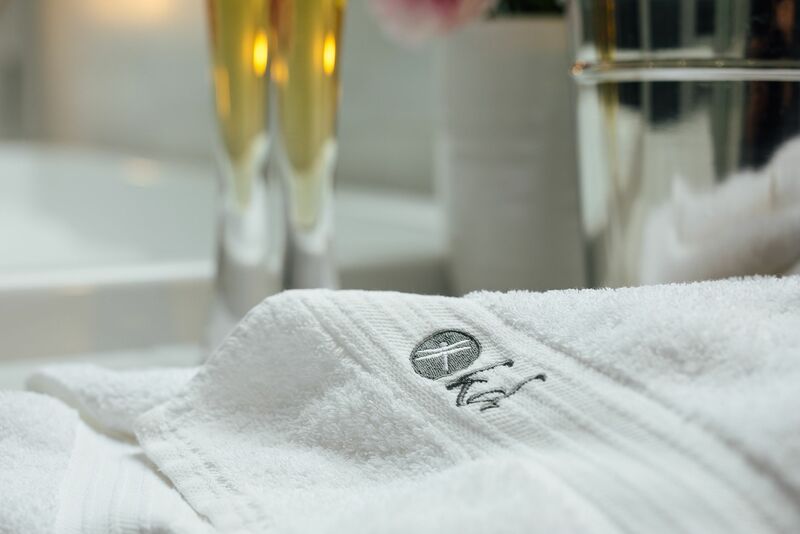 The 'wow' factor will hit you as soon as you walk through the door and we are confident that once you have visited us once you will be back year after year! 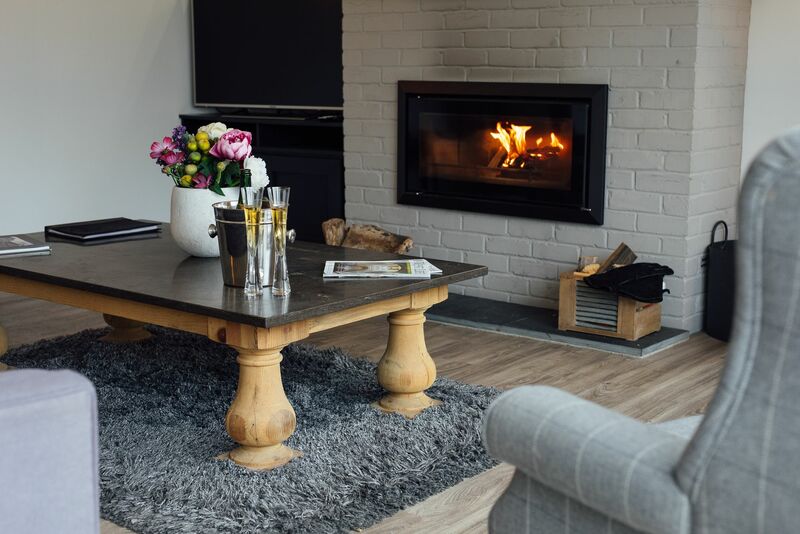 This self-catering holiday cottage enters onto the ground floor and leads through to the four downstairs bedrooms. 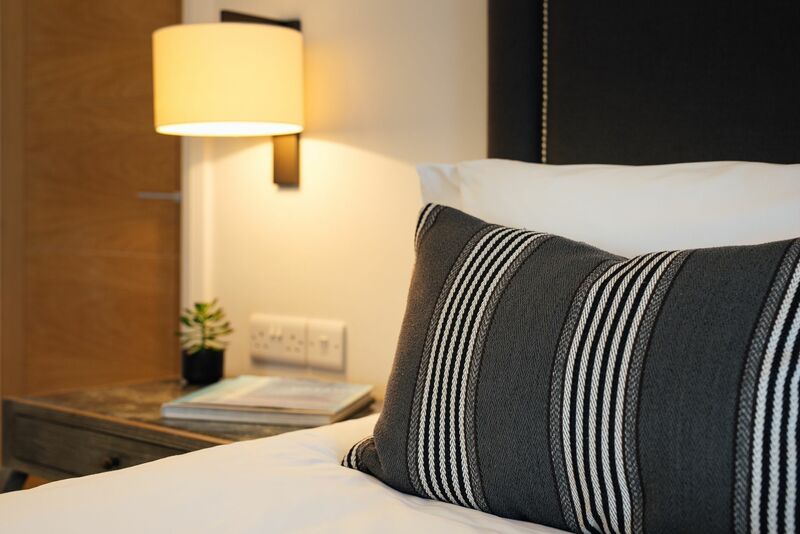 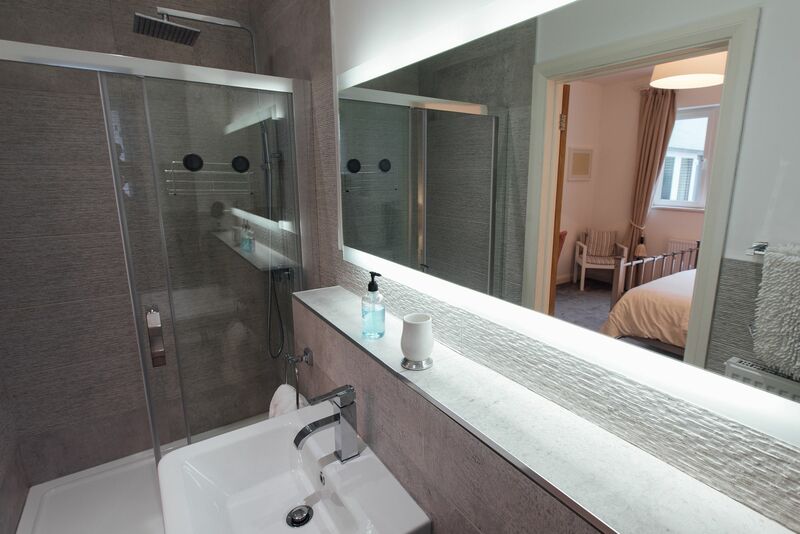 Bedroom 1 benefits from king-size bed with feather and black chrome bedstead and an en-suite shower room. 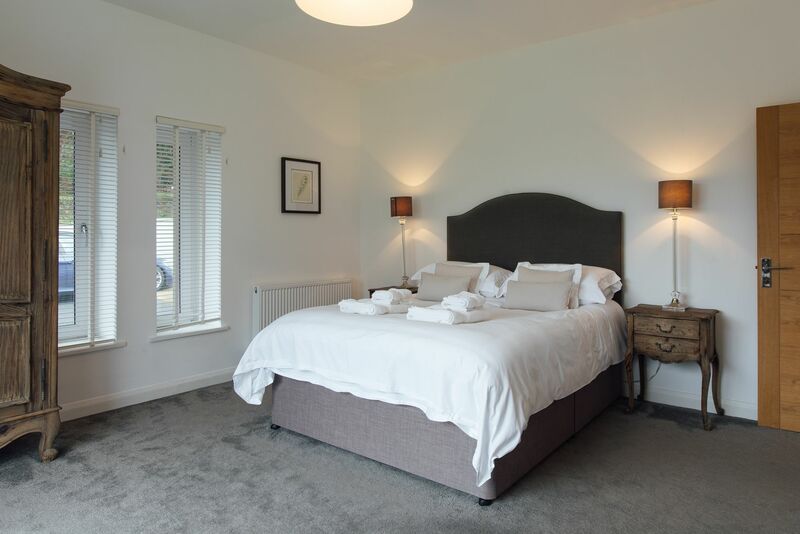 Bedroom 2 also boasts a king-size bed whilst bedroom 3 has twin beds. 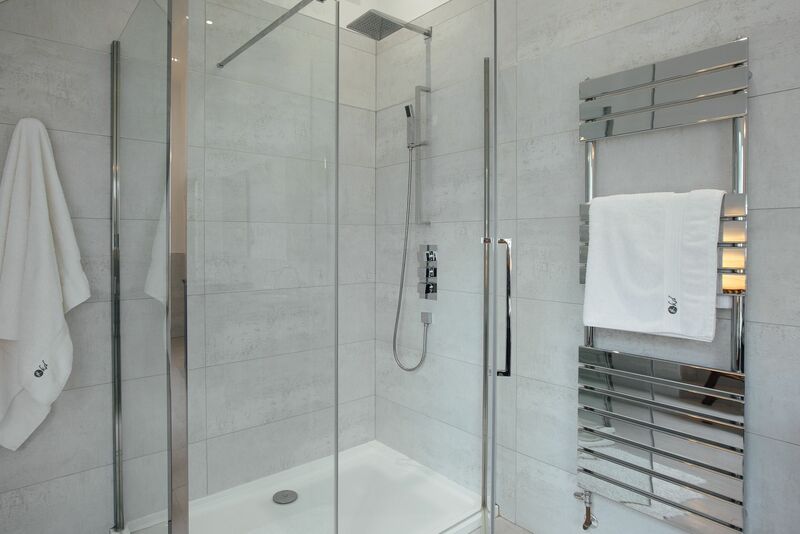 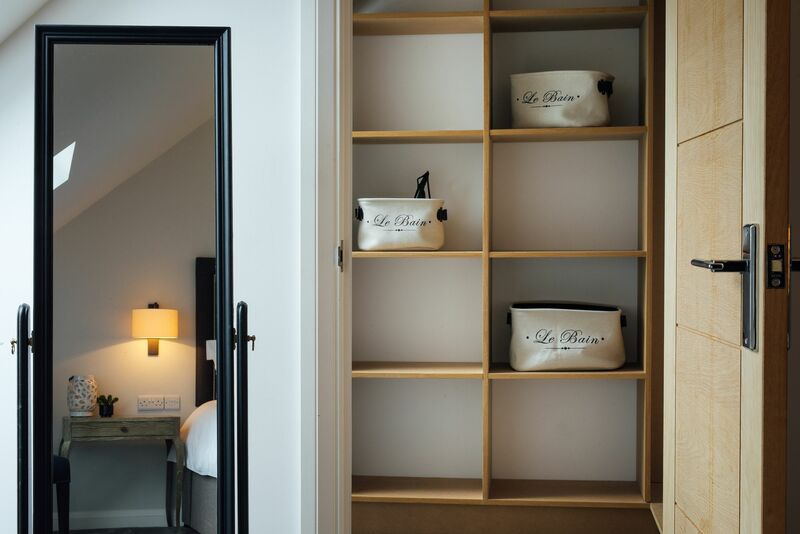 There is a separate shower room on the ground floor to accommodate the guests in bedrooms 2 and 3. 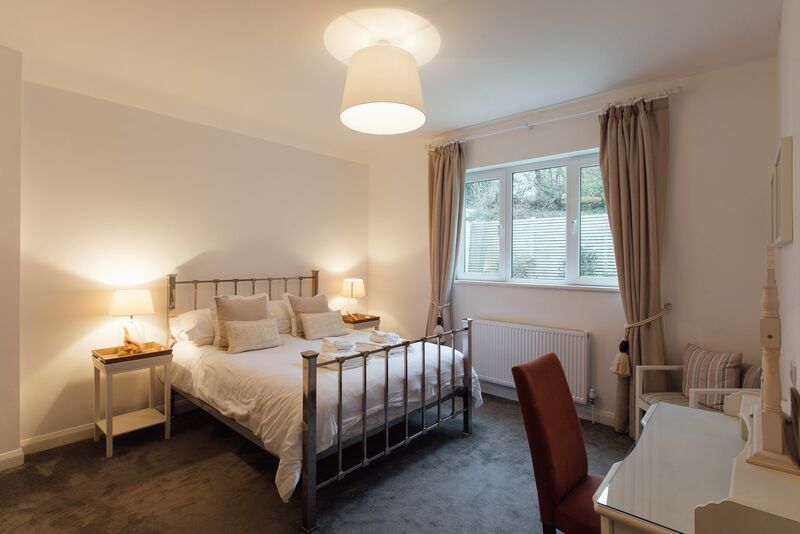 Both of these bedrooms have large windows which over look the large patio and garden. 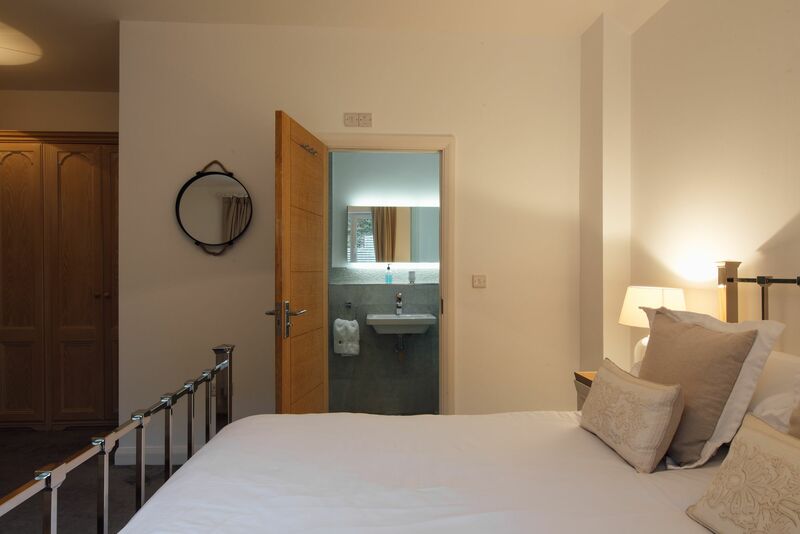 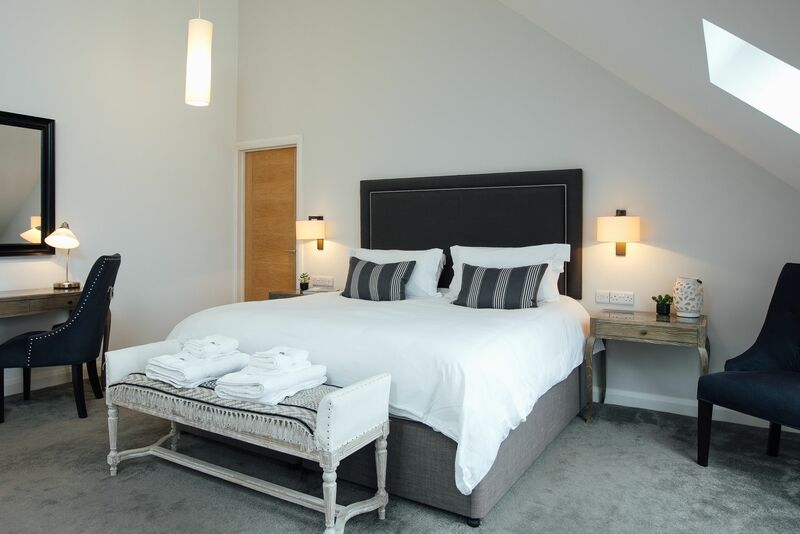 Bedroom 4 provides a king-size bed and an en-suite comprising bath with shower over, wc and whb. 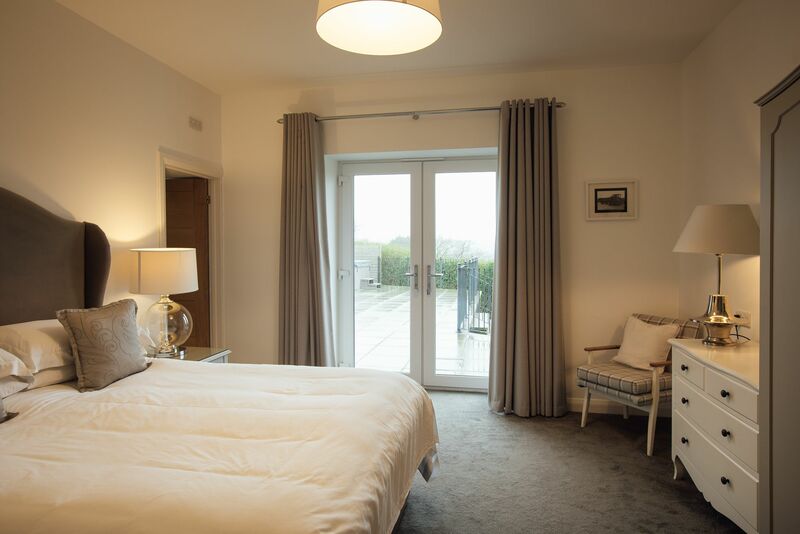 French doors from bedroom 4 offer views over the village and Pembrokeshire countryside and lead on out to the large patio terrace and garden. 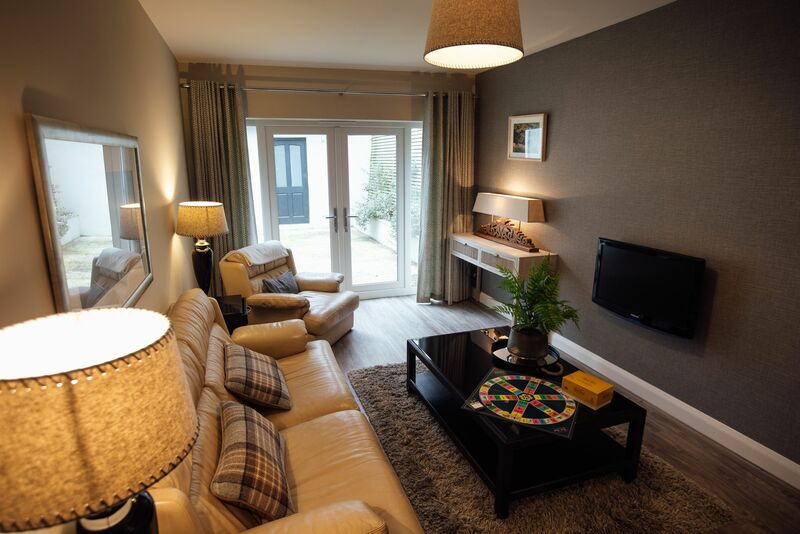 The large hallway takes you on through to the cosy TV room with leather sofa seating which comfortably seats at least 4 people. 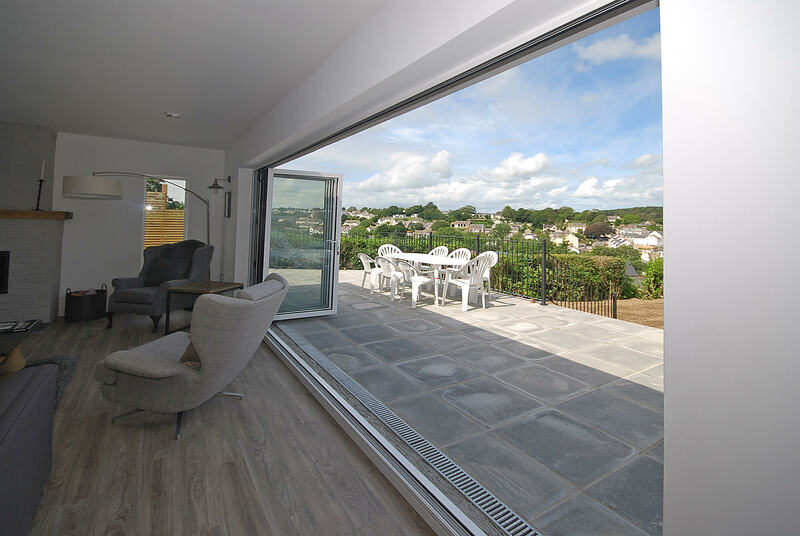 French doors lead out to a seperate, smaller enclosed terrace with outdoor seating - a real sun-trap through the summer months. 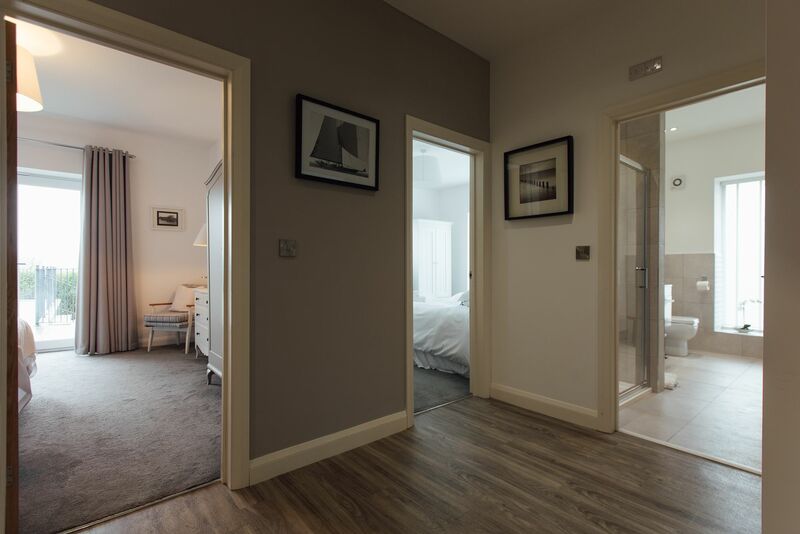 The spacious corridor leads on through to the open plan kitchen/dining/living area from where guests can enjoy partial sea views and views across the village. 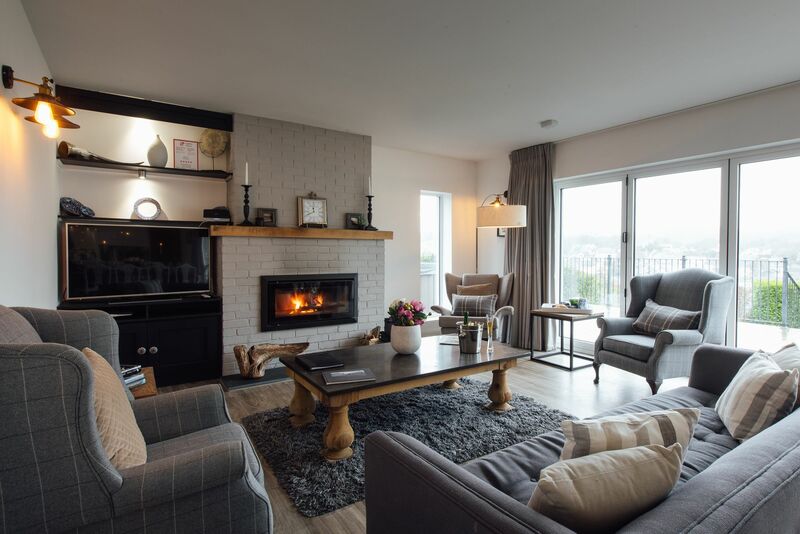 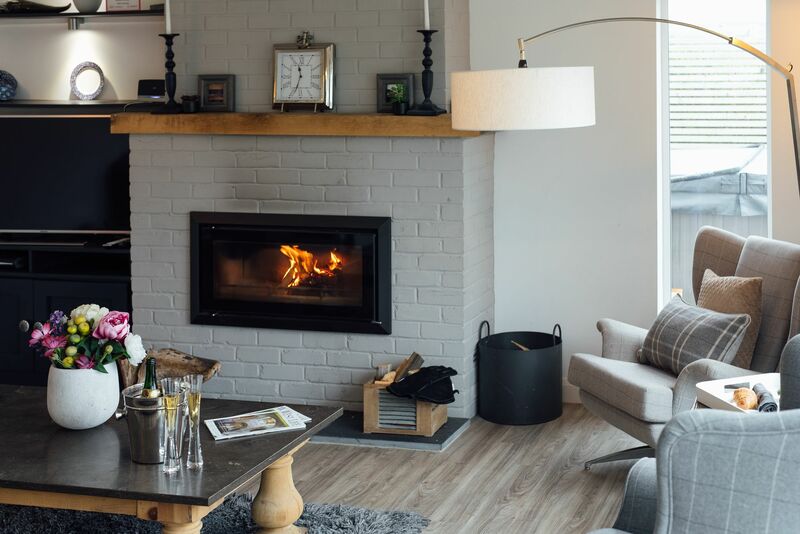 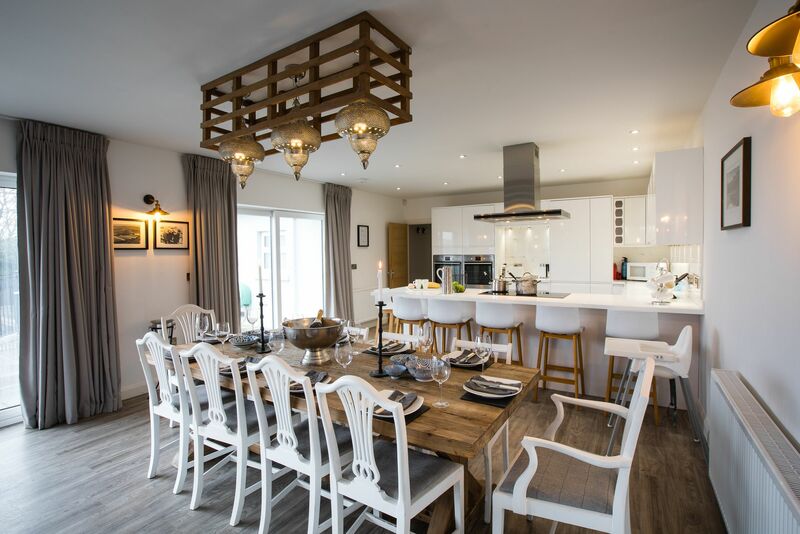 The living area offers comfortable seating for up to 8 people with large flat -screen TV, Sky TV, log burner and bi-folding doors which open the whole room out onto the large patio terrace which also enjoys the coastal scenes - perfect for outdoor living during the summer months. 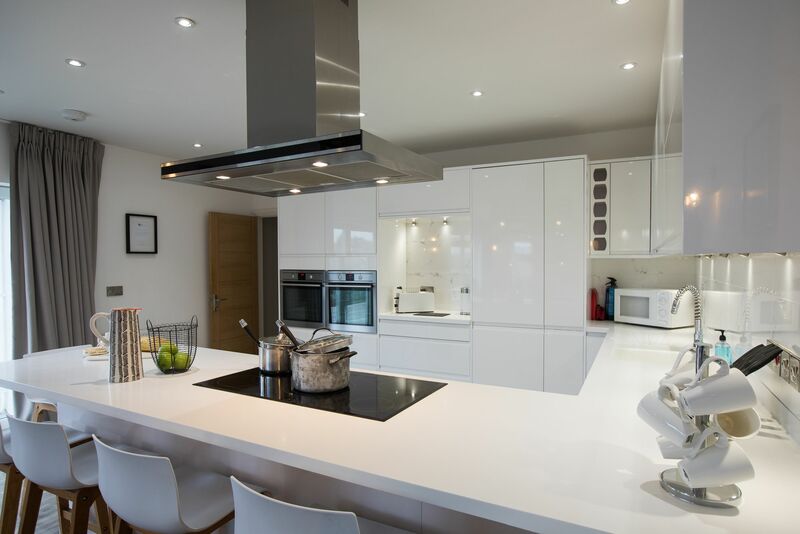 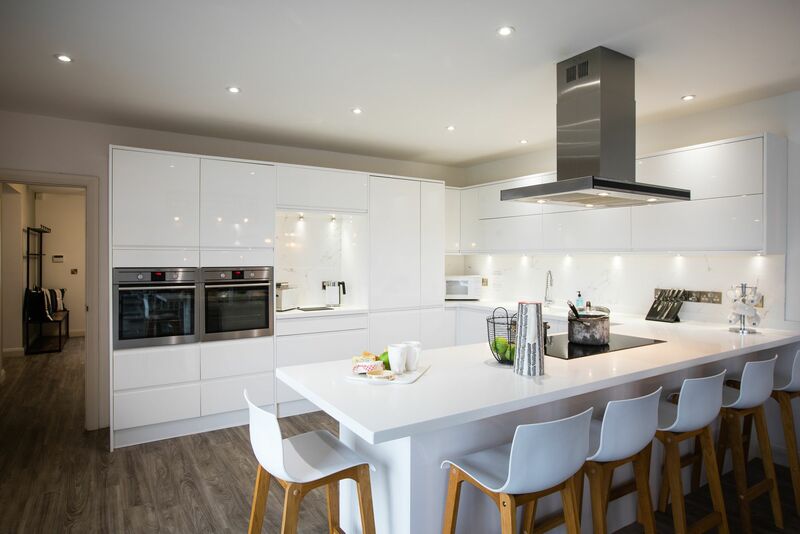 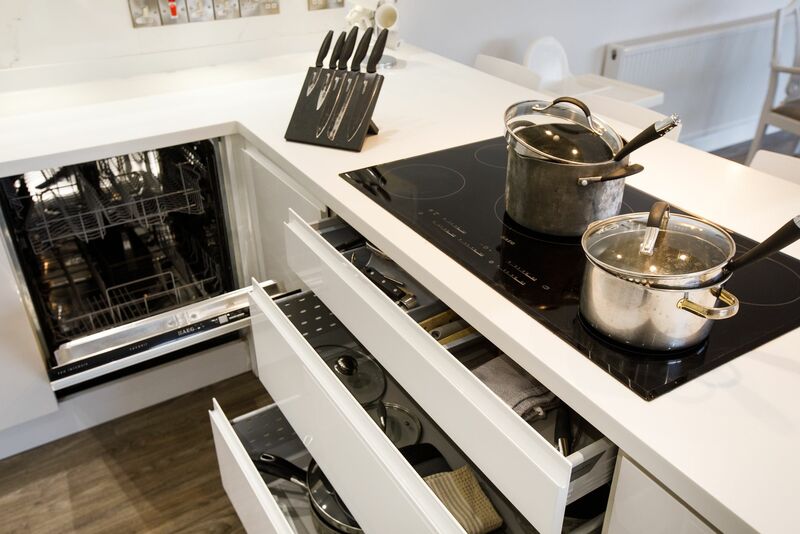 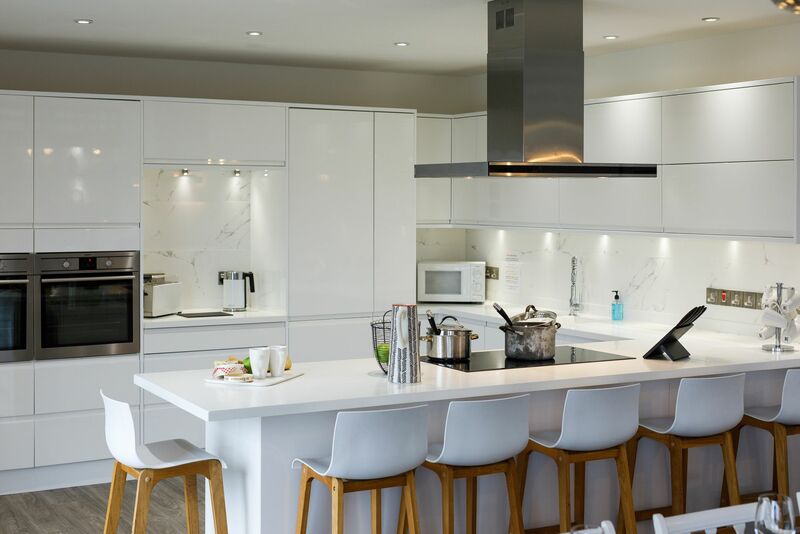 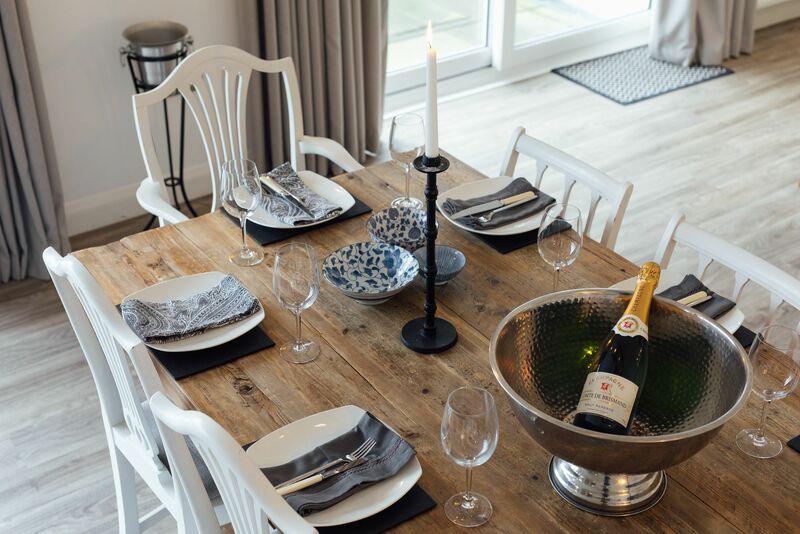 The kitchen is exceptionally well-equipped with everything you would expect to find in your self-catering cottage including microwave, dishwasher, large fridge, freezer, wine cooler, double electric oven and electric hob. 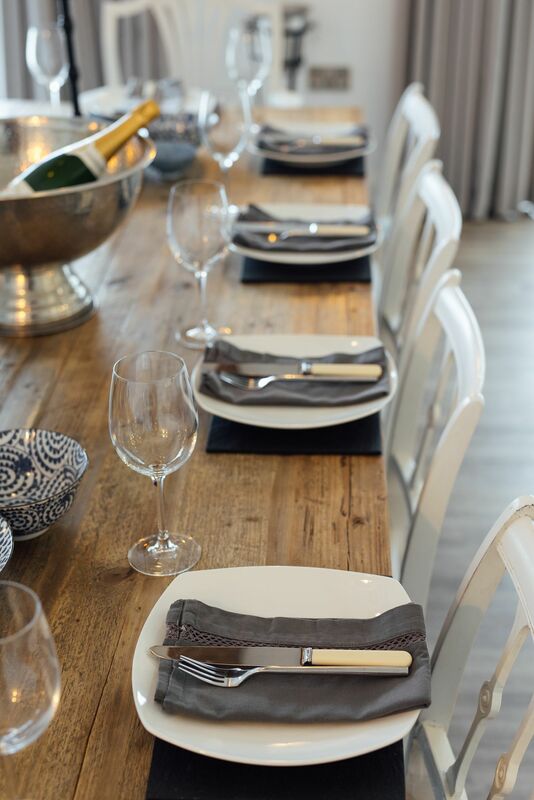 The dining area offers seating for up to 10 people and there is also a convenient breakfast bar with seating for up to 6 people. 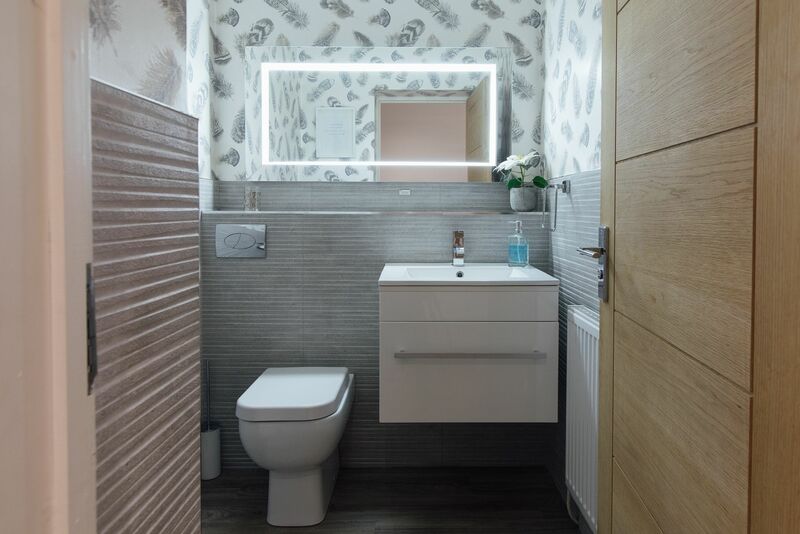 The ground floor further benefits from a utility room with washing machine and tumble dryer and a cloakroom with wc and whb. 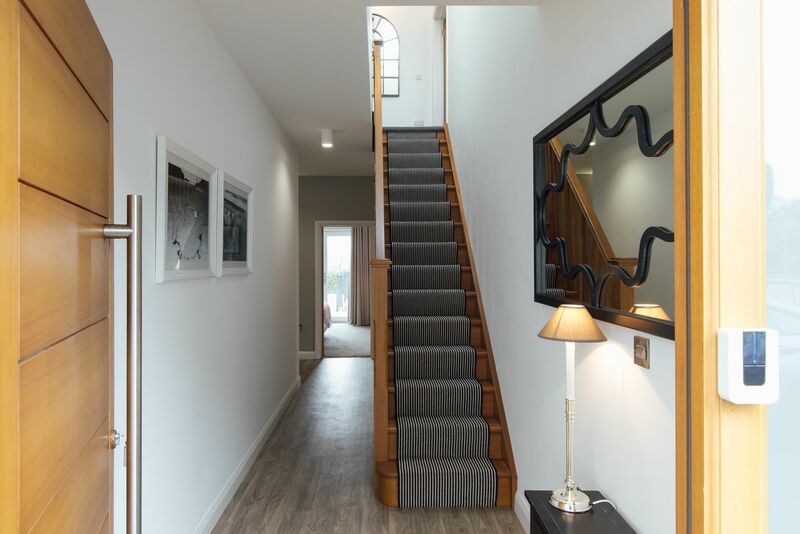 Stairs lead up to the second floor where you will find vaulted ceilings throughout. 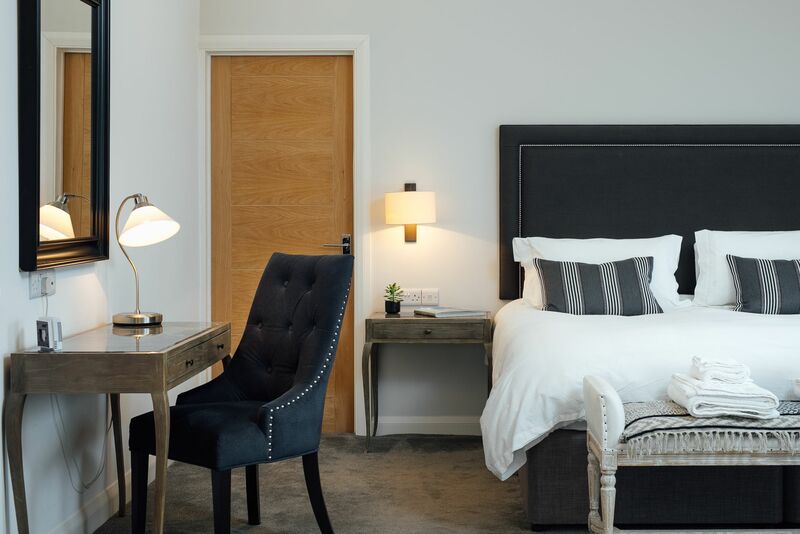 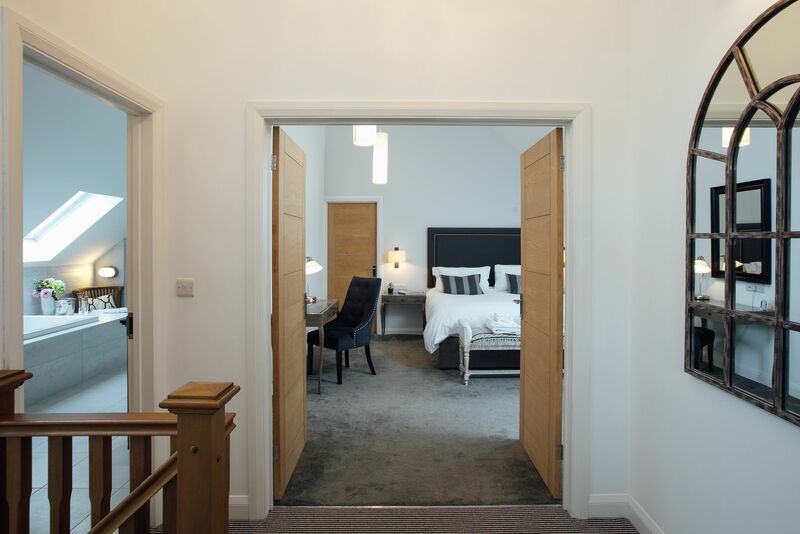 Double doors lead through to the fifth large bedroom with kingsize bed and a large separate dressing room. 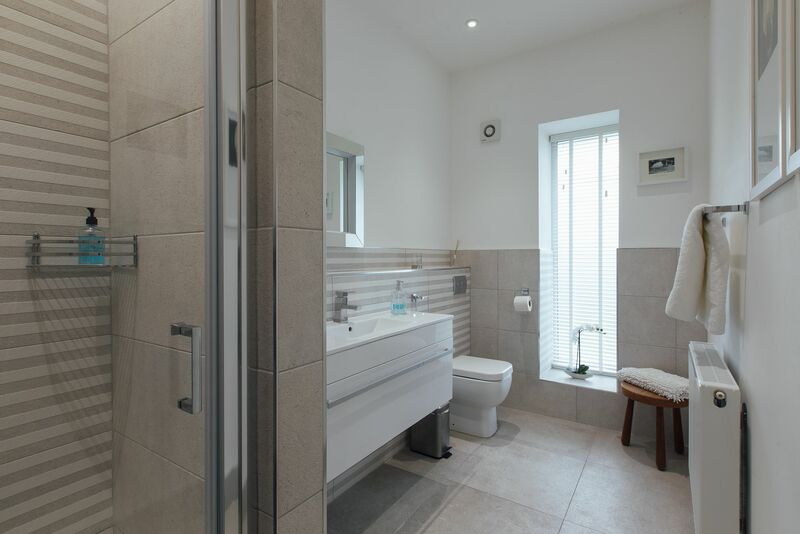 Next to this bedroom is the large fourth bathroom with large bath and surround, spacious shower unit, heated towel rail, double sink units and WC. 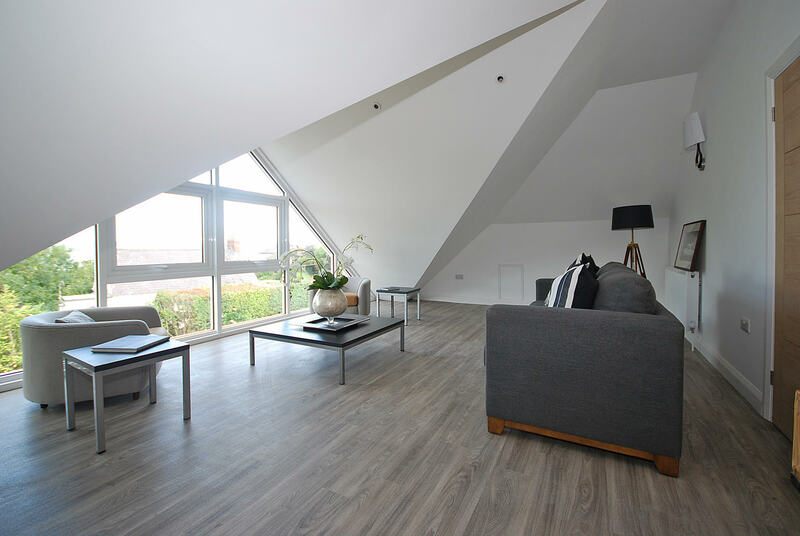 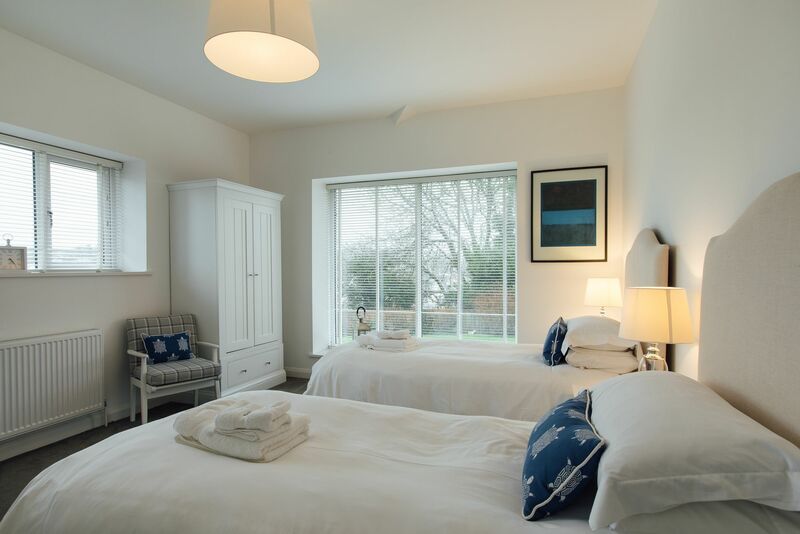 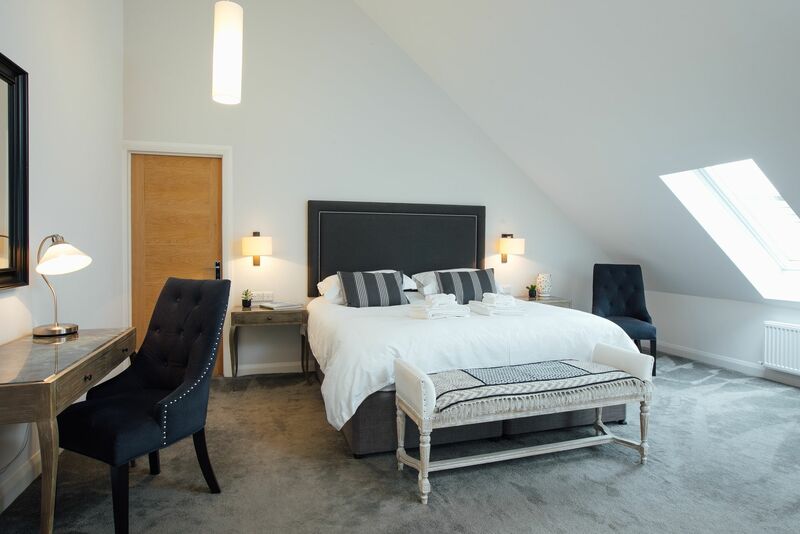 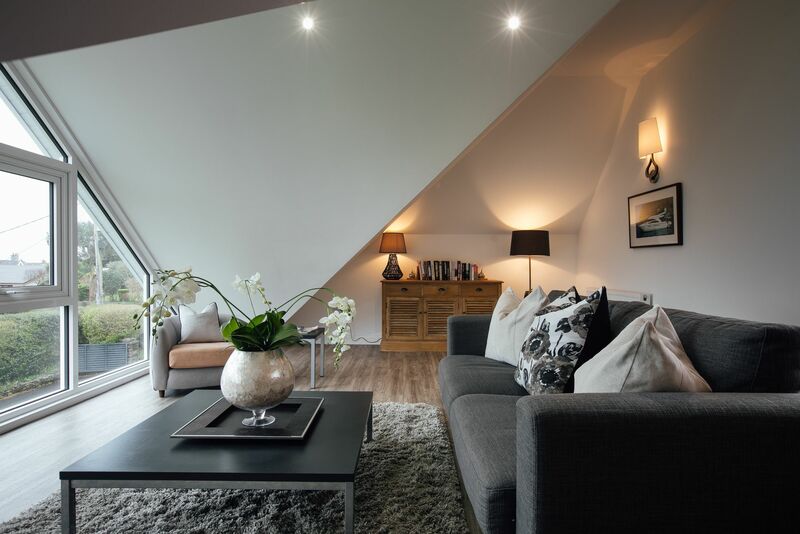 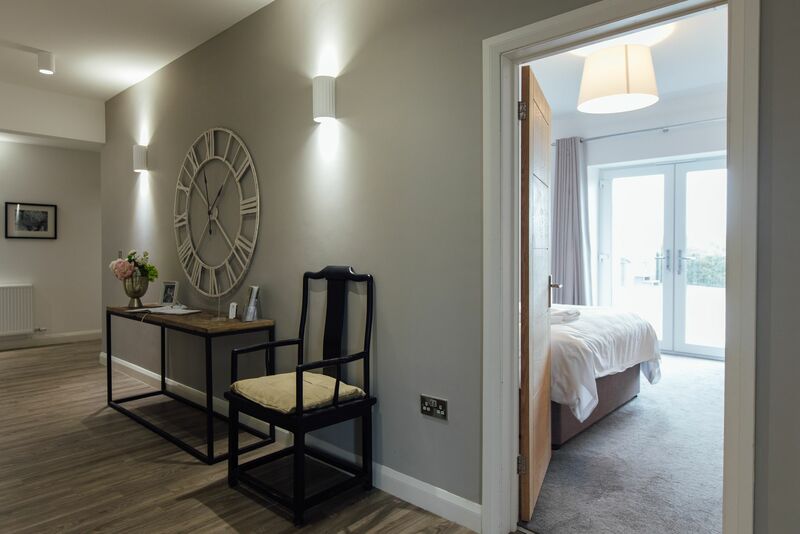 On this floor double doors also open into the sky room - a peaceful area which boasts wonderful views over the village, bay and Pembrokeshire coastline. 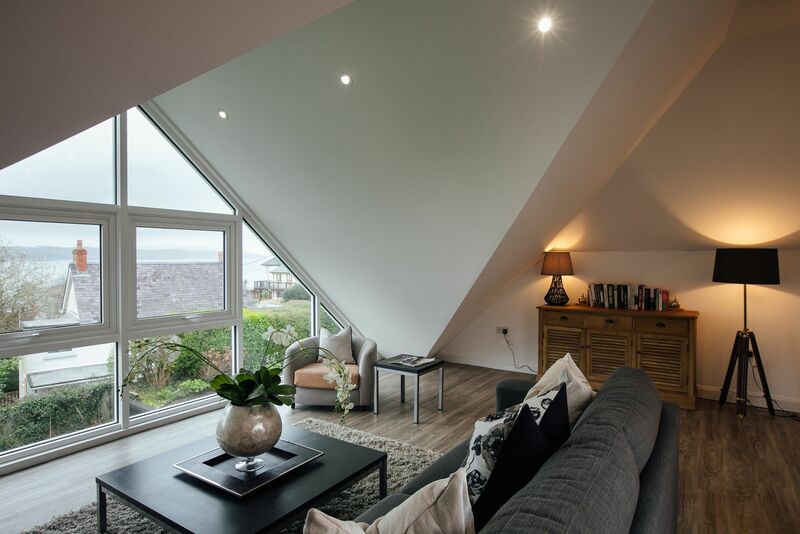 Comfortable seating for up to 5 people provide a tranquil space to relax after a busy day exploring the coast. 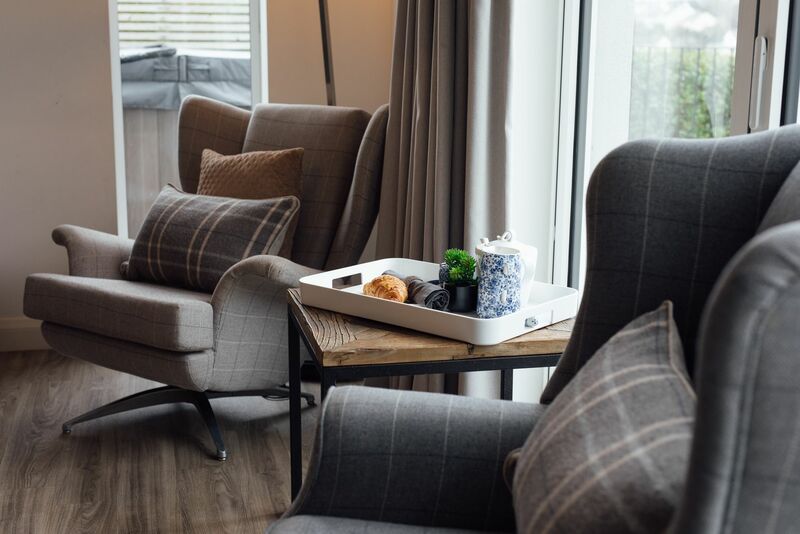 Outside, the patio terrace off the living area has seating for up to 10 people with sun loungers, parasol and a BBQ also provided. 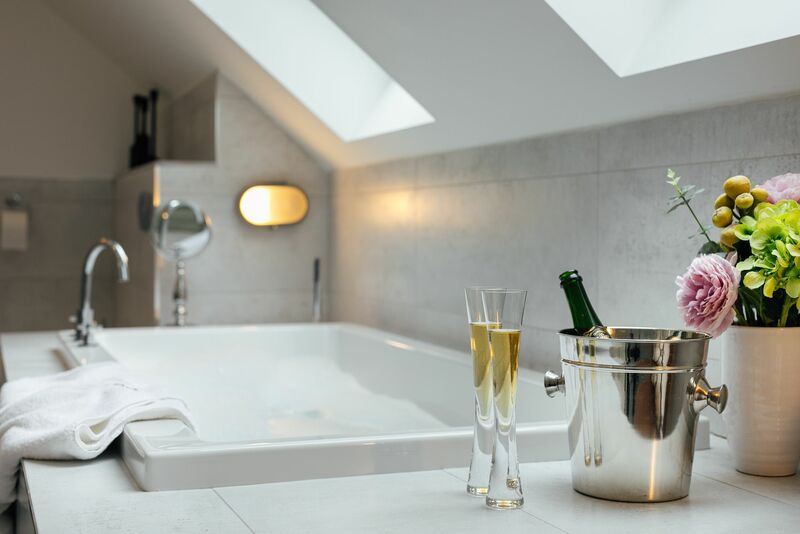 The therapeutic hot tub is the perfect place to relax and enjoy the views at any time of the day. 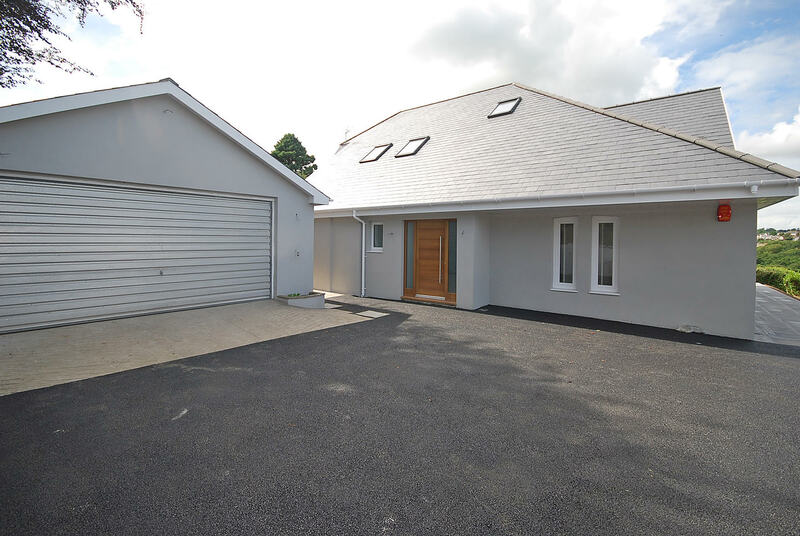 Steps (or ramp) lead down to the large garden which provides plenty of room for larger families to enjoy the outside space. 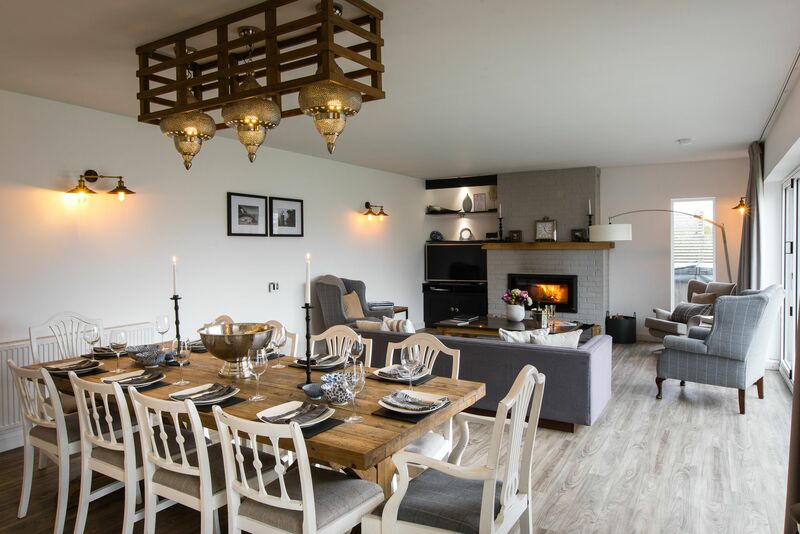 The property is centrally heated throughout and also offers free WiFi, Sky TV and a gated driveway with parking for up to 5 cars. 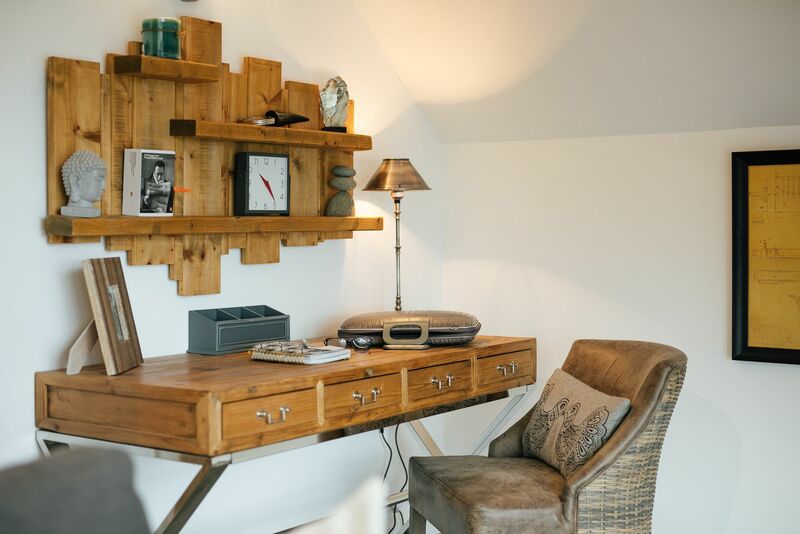 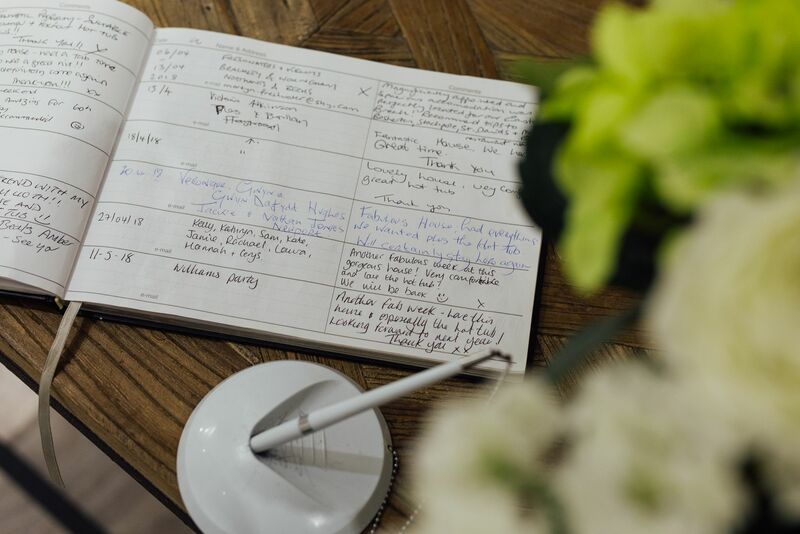 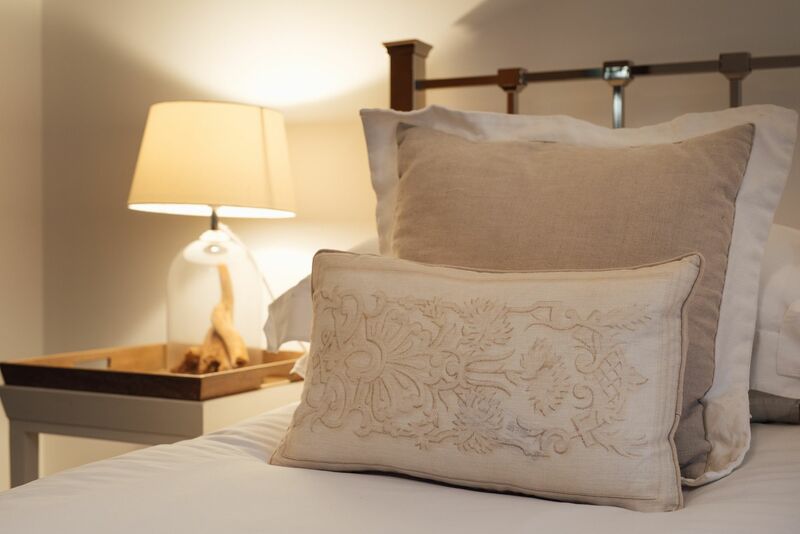 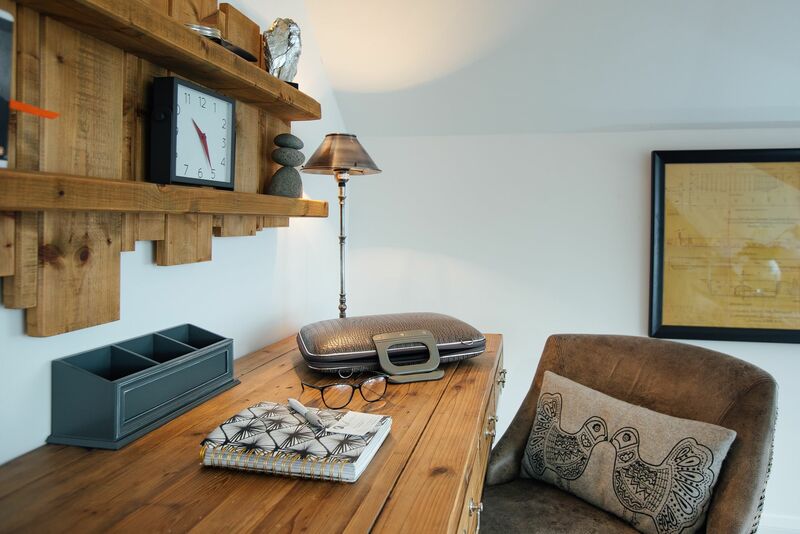 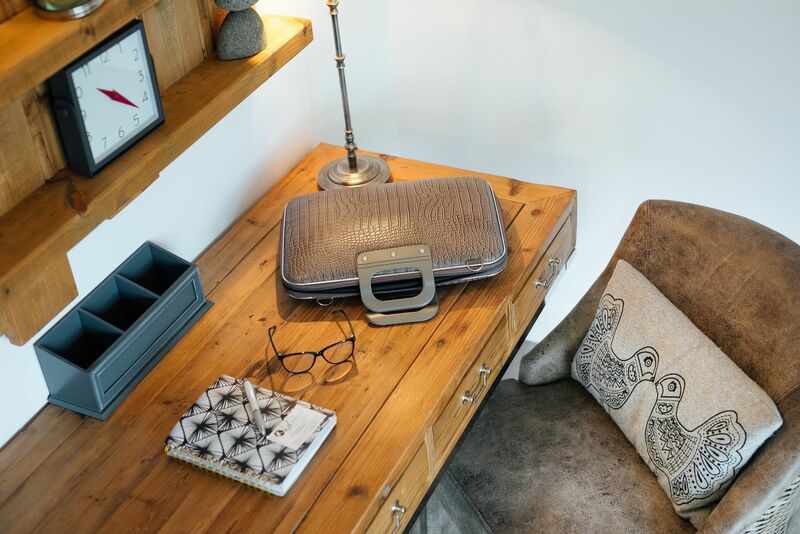 A stay in The Hawthorns is a unique experience and one that can be enjoyed at anytime of the year - Mid-week and weekend breaks available Nov-March inclusive (or where there is late availability).